In the code snippet above, it is important that you set the version of Numpy (e.g., 1.11.0) that we want to install. 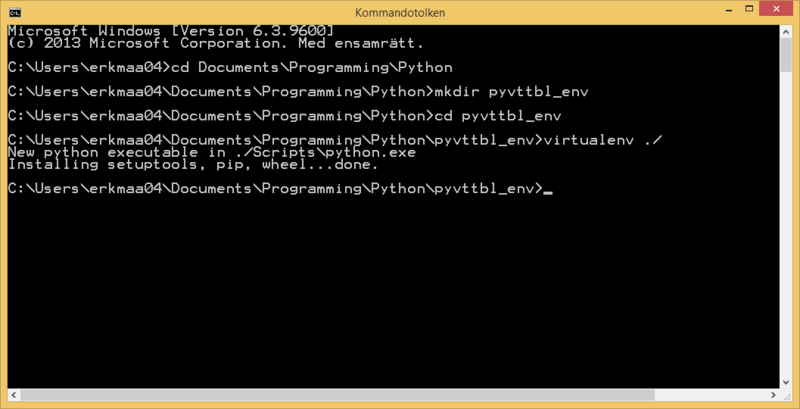 Thus, we get the version that have been previously working with Pyvttbl. Finally, if we want to do our ANOVA in a jupyter notebook we need to install a new kernel that uses the one in the virtual environment. If we follow the image above, we also start up a Jupyter notebook. When creating a new notebook to run our python ANOVAs using pyvttbl in we need to select our new core (i.e., pyvttbl_env”). In the notebook below (after Windows set-up) you can see that we don’t get the error “unsupported operand type(s) for +: ‘float’ and ‘NoneType’”. Note, we do get a warning that in the future what pvttbl is trying to do is not going to work. Next step for Windows user is, of course, similar but we need to start the Command Prompt (here is how). Lets change the directory to where our Python project are intended to be stored and create the new Pyvttbl environment. Now that we have a virtual environment set up we can install an older version of Numpy. Here we will also depart on how this is done in Linux. I had a bit of a problem with installing Scipy (Pyvttbl depends on Scipy, for instance) using Pip. In this notebook, we can run our ANOVA using pyvttbl without the “unsupported operand type(s) for +: ‘float’ and ‘NoneType’ error! That was it, now we can use Pyvttbl on both Linux and Windows computers without the problem with float/NoneType. This is of course not an optimal solution but it does the trick. If anyone have another ideas on how to solve this problem, please let me know. Thanks for your comment! I have totally missed that statsmodels now have RM-ANOVA. I will look this up and update my other posts. I am looking forward to your new post about how to conduct a repeated measure ANOVA with statsmodels! And I also wonder how to calculate η^2 and relevant correction for sphericity. Thank you for your effort! Nice to hear. I will look into eta-squared and sphericity correction also when I have time. Ok. Cool. Good to know. Have you tried it out?